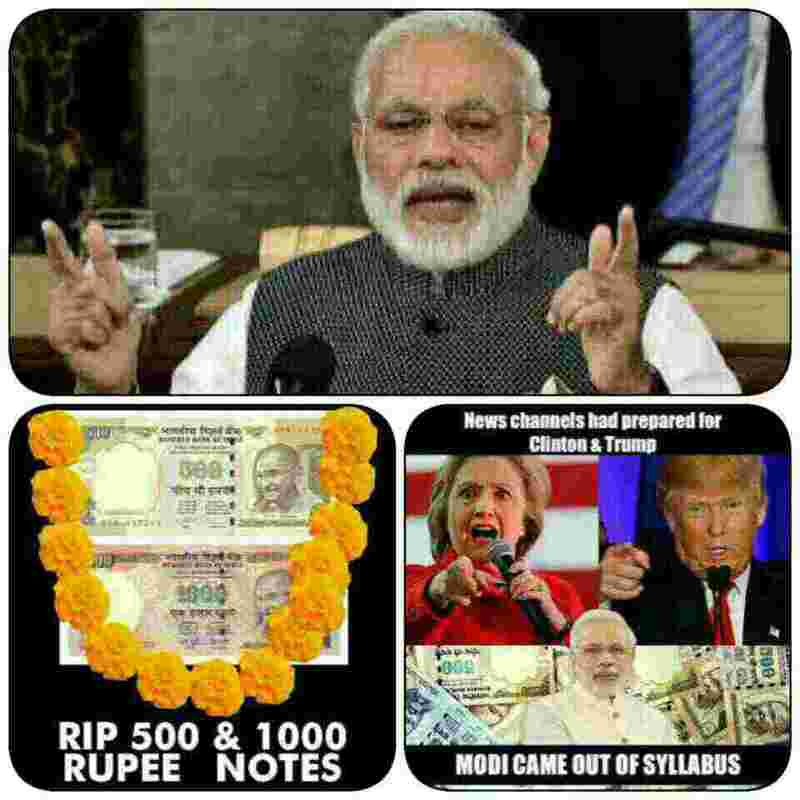 PM Narendra Modi gave a historical decision on 8th November 2016, in which Rs 500 and 1000 notes were denominated. Some political parties of opposition and NDA, Bollywood actors and directors have supported this decision of denomination of Narendra Modi government. But some politicians and political parties are totally against decision of 500 and 1000 Rs denomination. Rahul Gandhi and Arvind kejriwal is not leaving even a single chance to capture votes. Sometimes a good decision is taken to a very low level by such kind of politicians. People are ready to accept situation but they want to raise every issue in which they get benefitted. Ruling party Bhartiya janta party have supported there government for denomination of 500 and 1000 Rs notes. Party chief Amit shah called it a historical decision and said this will end black money. Janta dal united chief and Chief minister of Bihar Nitish Kumar supported central government's decision and said any decision against black money and corruption, janta dal united will support him. Remember JDU is only party who have supported decision of Modi government. NDA leaders and parties like Shiromani Anjali Dal and Lok janshakti party have supported Modi government's decision and said NDA wil support every decision of Modi government against corruption in Nation. NCP chief Sharad pawar also called this decision as historical and said this decision will help India and strength economy of India. Most important is every citizen of India who is honest ans want good future of nation is behind PM Narendra Modi and central government. They are standing in line but saying we are with PM Modi. Some Political parties can't accept decision against corruption ever and this time also they haven't accepted and supported historical decision against corruption and black money. Some political parties and leader like congress and Aam aadmi party is not leaving any chances to capture votes. Congress party is trying to capture votes by talking about problems of common people. Rahul Gandhi stood in queue to withdraw Rs 4000. He said Modi was smiling in Japan and crying in india. Aam aadmi party did not miss any chance to indulge in national politics. He never say anything on issue of Pakistan but didn't miss to capture votes this times . He said PM Modi should take his decision back. He said common people is getting problem and PM have declared economical emergency with his decision. Shivsena said by there official magazine 'saamna' that with Modi government's decision of denomination of notes , 125 crore people are on roads today. Shivsena asked central government to give some more time to use old 500 and 1000 rupee notes. Trinmool congress is so angry with this decision that they are ready to take support of there biggest rivals communist party of India. Samajwadi leaders have also asked Modi government to take this decision back for some time. Bollywood actors Akshay Kumar, Anupam kher , Aamir khan, Ajay Devgan, around rampal and directors and producers like rajkumar hirani called this a wise decision, and said there will be some problem for some days but it going to benefit for long time. Modi government said to all political parties who are trying to take advantage and want to capture votes that people are with central government's decision and decision will not be taken back. He said common and honest people are sleeping after this decision and corrupt people and black money holders are looking for pills. 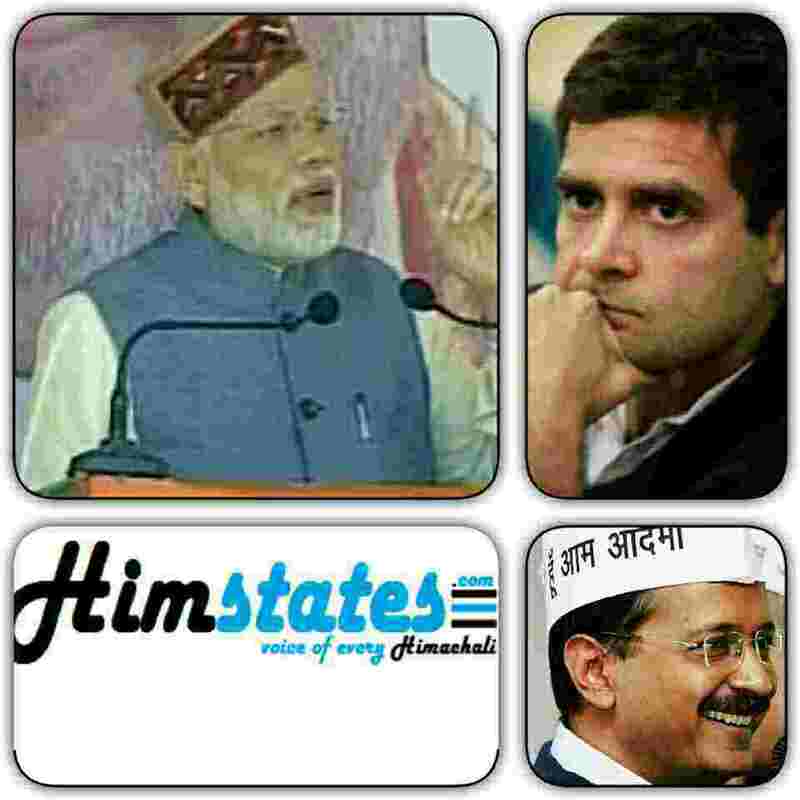 Himstates advise every individual in India ,please don't panic. Support central government and its decision. This is decision against corruption and black money, people in country no need to worry. Be honest and show your real money and save yourself and others from foolish rumours. He said this is just a start against corruption. Pm Modi said in Goa rally that we have to cure diseases of 70 years corruption in 17 months. He said to buy jewellery above 2 lakhs PAN number is needed. Prime minister Modi thanked people of India for supporting him on this decision of discontinuation of 500 and 1000 rs. Notes in India. He said I know there may be problem to common people in India, but good people should not worry about this . Only corrupt people need to worry. But common people and tax serving people are helping me. Some days ago congress vice president stood in queue to withdraw money. Modi attacked him in funny way and said those who did 2g , coal scam they are standing in line to withdraw money. He also said today many politicians and corrupt people are in situation where they can't even say anything wrong about this decision. Prime minister Modi said in Goa rally that I have left my family , home and state for country. I am not greedy of position . He also said I am not made for any position , I want to just serve nation. Modi also got emotional while addressing people of Goa. On issue of corruption Modi said he know what he is doing. When he take step of Jan dhan yojna several politicians made fun of it. But he is doing everything step by step. So this is not full stop on corruption , this is just starting . Just give me 50 days and than you will see your expected nation. He said his next decision will be on undeclared property. He said I have several projects in my mind against corruption. Modi said that I know corrupt people will not leave him because he is taking money of 70 years after independence. But he doesn't fear from anyone. Some people keeps doing politics it's there work. I don't care about them. For betterment of people of India and honest people every step will be taken . This is just starting some more strong steps will come soon. PM Modi said it takes 90 days for election in our country. I am just asking 50 days , I know there will be some problem but after 50 days if you'll feel this decision wrong whatever punishment you will give I am ready to have that. But give me just 50 days. He said every honest people is with me , this is just against corruption. Congress vice president celebrated his 46th birthday. Rahul Gandhi is son of former prime minister rajeev Gandhi and present congress president sonia Gandhi's son. He became MP first time in 2004. In January 2013 he became vice president of national congress party. Truth in aam aadmi party is banned how? 2013 : Tripura, Nagaland, Delhi, Rajasthan, Madhya Pradesh, Chattisgarh. This time congress in just himachal , manipur, mizoram, uttrakhand, karnataka. Only 7% of Indian population lives in congress ruling states. 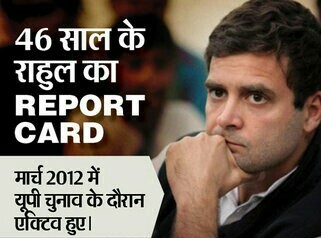 Being a oldest party in India , now only in 7% is real concern for rahul Gandhi and congress party. Now in 2016 there is no more elections left. But 2017 will be a big challenge for Rahul Gandhi and congress party. In 2017 all parties will be in action in Punjab , Himachal, UP, Manipur , Goa and gujrat. In gujrat and Goa elections will be in the end of year but UP and Punjab elections will be biggest challenge for Rahul Gandhi. In UP it is expected priyanka vadra can be biggest ace for congress party. She is only one who can save rahul in UP. From 2012 to now 28 elections were faught under his leadership and won only 7. Congress Vice - President Rahul gandhi and Chief minister of UP Akhilesh Yadav are new Karan- Arjun of Indian Politics. Congress and Samajwadi party star leaders did Press conference in Taj Hotel and road show in Lucknow from Gandhi Pratima to Clock house . Rahul gandhi and Akhilesh yadav both attacked opposition specially Bharitya Janta Party and RSS. Rahul Gandhi showed respect for BSP supremo Mayawati. Rahul Gandhi and Akhilesh Yadav called Bhartiya Janta Party(BJP) as politics of anger and divisiveness. They said aim of alliance is to fight against politics of anger and divisiveness. Mulayam singh yadav is against this alliance of Congress and Samajwadi party and he said he will not campaign for Samajwadi party in coming elections 2017. This will be interesting to see if this alliance create history and will Akhilesh yadav and Rahul Gandhi repeat what happened in Bihar, where RJD and JDU alliance together to fight against Bhartiya Janta Party. What Rahul and Akhilesh said in Press Conference ? Rahul Gandhi and Akhilesh yadav did their first press conference together and they were first time together. There bonding was important to watch. Both were responding for each other. Both Akhilesh and Rahul said that they are not just an alliance but they are good friends. They also said that Congress and SP have same ideology. Some main points of their press conference is give below. They said BSP is not dangerous for Indian politics and country but BJP is dangerous for country. Rahul and Akhilesh said BJP used to do politics of anger and divisiveness and their alliance is to stop BJP. Both Leaders called each other good boys. Uttar Pradesh CM Akhilesh said he is happy to work with Rahul Gandhi and they will get more than 300 seats out of 403 total seats. He also said referring their party symbols "If the hands is with the cycle, and the cycle with the hands, imagine speed". 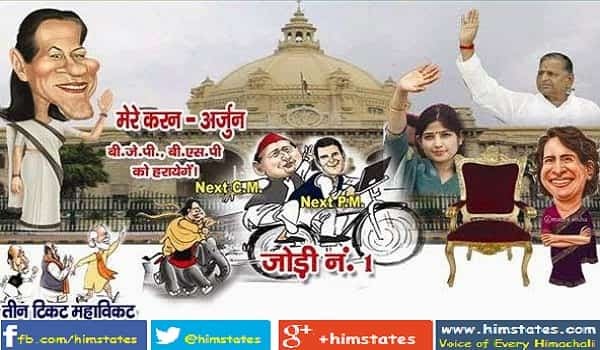 Akhilesh called Rahul gandhi and him two wheels of the cycle. Rahul gandhi called Akhilesh and him as meet of Ganga and Yamuna, when asked who is ganga and who is yamuna. Akhilesh said they are Sangam of Allahabad. Rahul called alliance as triple P in Modi ji style, which means Progress, Prosperity and Peace. Akhilesh yadav added fourth P in this and said fourth P means People's Progress, Prosperity and Peace. When Akhilesh asked about alliance for future he said this alliance is for 2017 UP elections and time will tell about future. Mulayam singh yadav said today he is against alliance of Samajwadi party and Congress party. Mualayam singh yadav also said this alliance is against workers and leaders of Samajwadi party. He said this alliance will not allow SP leaders to receive tickets. Mulayam Singh yadav also said Samajwadi Party is able to win alone in Uttar Pradesh. He said he will not campaign for Samajwadi Party. Mulayam Singh Yadav is sad with this alliance specially with congress, he said congress party had not progressed country. Mualyam Singh Yadav is against alliance, and he do not want this alliance as he believe SP can win alone in Uttar-Pradesh. Mulayam Singh will not campaign for Akhilesh yadav and Samjawadi Party in election. Shivpal yadav and his supporters can help opposition to defeat SP candidates. Rajiv Shukla said some of congreess leaders are sad with this alliance if this happens , this can backfire for congress party also. Congress party nominated Shiela Dikshit as CM candidate to get votes of general , her supporters will be anti-congress with this. So alliance success and failure will be seen after 11th march, but Rahul gandhi and Akhilesh yadav showed their good friendship. Thousands of people were following Rahul and Akhilesh in streets of Lucknow. Workers of both parties were with Party flags in hands. www.himstates.com © 2017-18. All Rights Reserved.